When I first arrived in Ibiza in 1991 (as a clueless holiday rep) the island dynamic was very straight forward. Youngsters went to San Antonio, families went to Playa d’en Bossa/Es Cana, and couples/seniors went to Santa Eulalia. I’m generalizing but you get the idea. Playa d’en Bossa (or just plain Bossa) was predominantly a family resort but did have THE club in Space which opened at 6am and went straight through until the evening. Space opened its doors in 1989 and quickly gained an ‘anything goes’ reputation with the open air terrace being the place to be on a Sunday for sun, drinks, drugs and the best music in the world. The families directly across the road in the hotels Bahamas and Don Toni were all a bit bewildered but Ibiza is nothing if not tolerant. Bossa continued developing at a rapid rate until 2011 when the Fiesta group got into bed with the Ushuaia beach bar and turned one of their family friendly ‘Fiesta-land’ hotels into the Ushuaia Beach Hotel, something that is commonly known as a GAME-CHANGER. Ushuaia Tower quickly followed and then with the 2014 addition of the Hard Rock Hotel (the only HR hotel outside of North America) the transformation was complete: quiet family resort to full on party paradise in less than a generation. 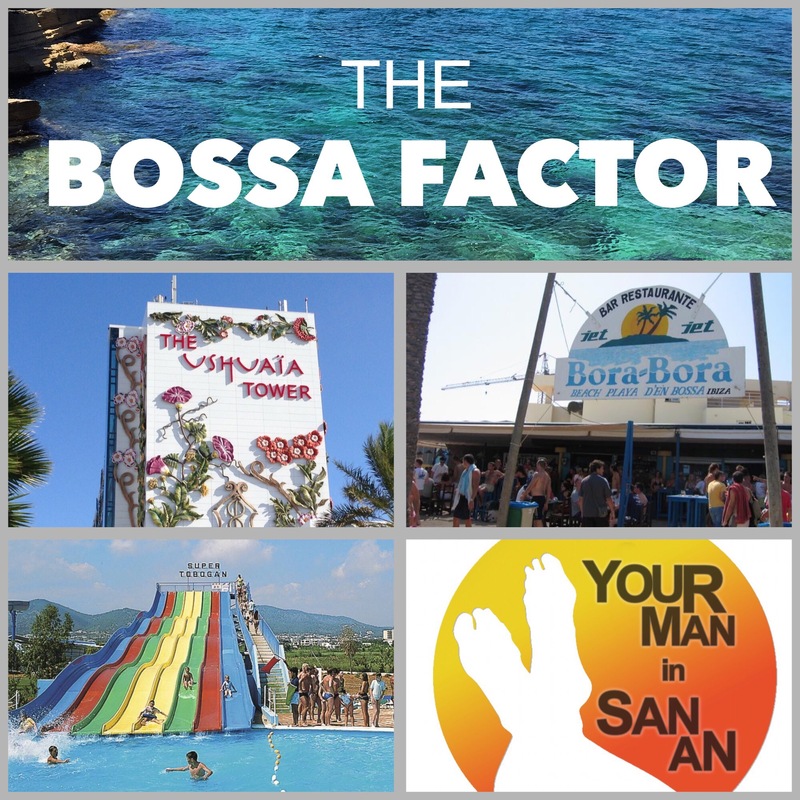 For me it’s been hard watching the rise and rise of Bossa whilst San Antonio has remained more or less the same but now with the added influx of seasonal ‘workers’ (but that’s another story which I will blog about later this week). To compare the 2 places is difficult: San Antonio is an urban nucleus with it’s magnificent bay and natural harbour but has fallen down the party pecking order through lack of investment and 2 ‘super’ clubs that appear to care about everything apart from client enjoyment. Bossa is a purpose made tourist resort that now has top notch bars and restaurants along its mile long beach and the world class venues previously mentioned. Although it’s billed as a mini Las Vegas any night in Bossa will also confirm your worst fears. A claustrophobic environment with hawkers and pushy PRs on every street corner. Of course we have some of the same issues on the west coast yet Bossa NEVER gets the bad publicity that San Antonio does, it would appear that memories are short as long as you have a few world class venues on your doorstep. So as Ibiza enters a new political era with elected socialist leaders in San Jose (Bossa’s municipality), San Antonio and also the island government it will be interesting to see if there are any major plans for Ibiza’s two biggest party resorts especially as San Antonio’s new Mayor Pep Tur ‘Cires’ has ‘promised’ a change of direction for San An tourism, this will be very interesting to watch. Also it’s worth mentioning that Vicent Torres the probable next Island President was a former tourist minister for the Balearics and was the man who signed the Ryanair winter flights agreement back in 2007.